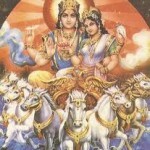 Ratha Saptami is observed on Magha Sukla Paksha Saptami or the seventh day of waxing phase of moon of the month of Magha. Ratha Saptami of this year is observed on Friday, 3rd February, 2017. 1)Head bath early in the morning before sunrise by keeping Ekka or Jilledu or Arka leaves on seven different parts of the body (two on shoulder, two on thighs, one on chest ,one on back and one over the head) and reciting the following mantra “Sapta Sapta Maha Sapta, Sapta Dweepa Vasundhra, Saptaarka Parnamaadyaa, Saptami Rahda Saptami”. 2)This has to be repeated for three times. 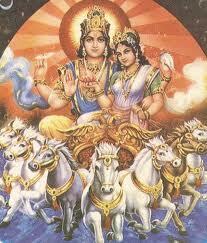 3)After bath, milk has to be boiled until it overflows and worship Sun God as the milk over flows. 4)The milk is boiled so that it overflows for three times. 5)Parvanam is made out of the remaining milk is offered as Naivedyam. 6)Drawing of Rath as Rangoli in front of the house is a common ritual. 7)Fast should be observed to please Sun God.